Managing one’s brand and reputation has always been an important part of running a business. At Contractor 20/20, our customer retention program, advertising, and “happy call” systems help reinforce your brand. However, with the advent of the internet new concerns have arisen. Angie’s List, Home Advisor, Yelp, Google Plus and others have created an environment where customers, angry or happy, can leave lengthy and detailed reviews of your company that are easily accessible through a simple Google search or an annual membership. Many customers depend on these reviews to determine which companies they should call. Because of this, part of reputation management now involves stopping bad reviews before they happen. At Contractor 20/20, we have created a system that stops bad reviews before they happen and gives your happy customers a place to brag about your service. Stop bad internet reviews before they happen. Give you a third party endorsement with predictable and reasonable standards. Give you a way to deal with customer complaints in a fair and friendly manner. Keep reputation management costs low. Give you great point of purchase reputation building opportunities. Optional low cost local pay per click and/or local search engine optimization. A fair standard of 75% complaint resolution to keep great service companies as members. A system of automatic quality control that protects members and consumers. Low cost. $0 set up. $15 a month membership. $15 per mediation as needed. No contract. Cancel anytime. Google adores information. The search engine giant is constantly revamping their search engine protocols to ensure users can find the most comprehensive information regarding local businesses. One part of their algorithm stems from online reviews. The better reviewed a company, the more likely their services are to be on display. Google will consider the average star rating, where your reviews come from, and the rate at which online reviews are received. The better your rating, the higher your search engine ranking. 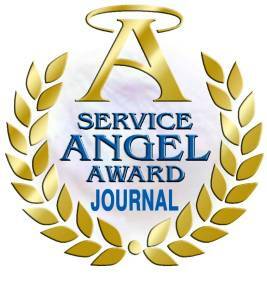 The Service Angel Award Journal is a website designed to give your happy customers a place to brag about your service. We post letters, videos, and phone interviews from your happy customers as well as display your certificates, organization memberships, company newsletter, charity participation, and employee standards and accomplishments. Linked to your website and social media, your Service Angel Award Journal also helps create a citation that builds your website ranking. Not everyone can be on this website—only members of Contractors United for Good who have a fair standard of 75% complaint resolution. As third party organizations, Contractors United for Good and the Service Angel Award Journal help you prove your trustworthiness in an industry where trustworthiness is everything. To learn more about our system and join give us a call today. Contractor 20/20 has searched high and low to find the best review building programs on the marketing. We have strategically partnered with these vendors and recommend only the best to our client. Our clients enjoy the same benefits of these programs at a group discounted rate.